McGlynn formed the choir An Uaithne in 1987, with their earliest concerts featuring medieval Irish and European music, contemporary choral pieces by Irish composers and Irish folk arrangements. He has stated: “My interest in traditional song stemmed from my schooldays in Ring College in Dungarvan, and I also felt a need to explore and communicate my enthusiasm for medieval music, most particularly Irish medieval music, to the general public. The eclectic repertoire that characterises the music of Anúna was born in this way”. McGlynn re-set and rearranged historical texts and reconstructions of medieval Irish music. These included the 12th century pieces “Dicant Nunc” and “Cormacus Scripsit”, both of which come from Irish manuscripts and featured in the repertoire of An Uaithne. Other reconstructions including “Miserere Miseris” from the Dublin Troper and “Quem Queritis” from The Dublin Play continue to feature in the repertoire of Anúna. McGlynn has said: “I think that one of the purposes of Anúna has been to open the door of obscurity to some of the many medieval pieces that we’ve recorded”. In 1991, An Uaithne officially became Anúna, a phonetic rendition of the Irish an uaithne (pronounced [əˈnˠuənʲə]). Once a group of classically trained singers, Anúna morphed into a choir of less trained, but still gifted, singers who could produce the earthy, raw tone that McGlynn was seeking. “This is the ‘Anúna’ sound – powerful and fragile, immediate and human. When I developed it, it was almost as a protest against the artificial nature of choral groups I had been part of, where singers appeared to sing for themselves, never as a genuine unit and never for the audience.” In 1993, they released their disc ANÚNA, a sixteen-track CD followed, in 1994, by the album Invocation. Both albums were licensed by the Irish label Celtic Heartbeat and released in 1995 The album Anúna achieved a modest Billboard World Music chart placing at number 11 in 1995. Anúna became associated with Riverdance from 1994 until 1996. They gave the first performance of the piece at the Eurovision Song Contest, spending 18 weeks at number 1 in the Irish single’s chart and reaching number 9 in the UK Singles Chart. They featured on the CD Riverdance: Music from the Show and on the DVD Riverdance: the Show. They sang the opening choral section entitled “Cloudsong” with a solo by soprano Katie McMahon. Anúna won an Irish National Entertainment Award for Classical music in 1994. In 1995, they released Omnis, followed by Deep Dead Blue in 1996. The latter gained an international release on the Gimell/Polygram label in 1999 and was nominated for a Classical Brit Award in 2000. The group left Riverdance in 1996. Anúna soprano Eimear Quinn won the Eurovision Song Contest in the same year in Oslo. In 1997 Anúna released the CD Behind the Closed Eye, an orchestral collaboration with the Ulster Orchestra, Northern Ireland’s leading symphony orchestra. 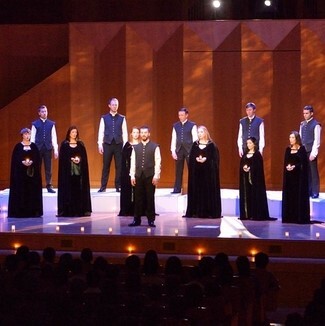 The choir appeared at the World Sacred Music Festival in Morocco in 1998 returning in 2002. In 1999 Anúna performed at the first ever Irish Prom at the BBC Proms in the Royal Albert Hall in London. 2000 saw the release of Cynara followed by Winter Songs (US Release title Christmas Songs) in 2002. The same year the group appeared at the “Proms in the Park” in Belfast, an open-air concert featuring The Ulster Orchestra in the grounds of Belfast’s City Hall. Their album Sensation, released in April 2006, was an eclectic collection, with settings by McGlynn of texts by Cardinal Henry Newman, Arthur Rimbaud and Hildegard von Bingen. The title track featured a spoken recitation of the Rimbaud poem “Sensation” by the Breton singer Gilles Servat. In January 2007, Anúna recorded a series of live performances in Cleveland which have been broadcast extensively on PBS across the US in a special produced by The Elevation Group and Maryland Public Television. The group undertook a two-month tour of the US in Autumn 2007. The album Anúna: Celtic Origins was released in the same year. It was the number one selling album in the World Music category of Nielsen Soundscan in August of that year. November 2008 saw the release in the US of Christmas Memories, a CD and DVD release coupled with PBS Broadcasts nationally in November and December. The album entered the Billboard World Music Charts at number 6 on first week of release and spent 10 weeks in the Billboard World Music top 20 albums. The single “Ding Dong Merrily on High” reached number 26 on the Billboard “Hot Adult Contemporary Tracks” chart in December 2008. In June 2009, Anúna released the CD Sanctus and DVD Invocations of Ireland. Sanctus featured four previously released tracks that have been remastered and in the case of one track, “Nobilis Humilis”, have had parts re-recorded and added to the original song. Also featured are McGlynn’s “Agnus Dei”, Miserere mei, Deus by Gregorio Allegri and Crucifixus by Antonio Lotti. Invocations of Ireland was a 56-minute DVD filmed throughout Ireland by Michael McGlynn, and featured the music of Anúna sung in the Irish landscape. The DVD was released on Columbia in Japan and was broadcast extensively on the Ovation Channel in Australia and New Zealand. In July 2009, Anúna gave the first performance of Behind the Closed Eye in the Republic of Ireland at Dublin’s National Concert Hall with the RTÉ National Symphony Orchestra of Ireland. The group performed again with the orchestra in July 2010, with Finnish violinist Linda Lampenius. The programme included a number of new pieces and arrangements including the nine-minute McGlynn fantasia based on the songs of Thomas Moore, “The Last Rose”. In June 2010, Anúna collaborated on a new CD and DVD project with The Wiggles, entitled It’s Always Christmas With You! and released in 2011. In September 2010, Anúna recorded an arrangement by Michael McGlynn of “Away in a Manger” with ex-Celtic Woman soloist Órla Fallon for her Christmas PBS special, which also featured David Archuleta and another ex-Anúna and Celtic Woman soloist Méav Ní Mhaolchatha. The special was filmed in Dublin, Ireland. No fewer than five of the soloists who have been featured on Celtic Woman since 2005 (Órla Fallon, Méav Ní Mhaolchatha, Lynn Hilary, Éabha McMahon and Deirdre Shannon) have been members of Anúna. On 27–29 January 2011, Anúna joined Irish musical pioneers Clannad for three concerts at Dublin’s Christ Church Cathedral for the Donegal group’s fortieth anniversary celebrations. They collaborated on five tracks, “Dúlamán”, “Caislean Óir”, “Theme from Harry’s Game”, “In a Lifetime” and “I Will Find You”. Anúna also performed a version of “Media Vita” as they came onstage, integrating musical elements of “Caislean Óir”. Anúna made their Chinese debut in June 2011. Cities visited included Chengdu, Wuhan and Hangzhou. In Beijing they performed at the Beijing Poly Theater and in Shanghai at the Shanghai Oriental Art Center. In July 2011 the National Concert Hall in Dublin presented the first Anúna International Summer School. The event took place between 5 and 9 July, and featured a team of international facilitators including Matthew Oltman, then musical director of Chanticleer. In September their album Christmas Memories débuted at 95 in The Billboard 200. To finish the year, Anúna visited Japan, a trip which included concerts and workshops in Tokyo, Niigata, Hyogo, Kagoshima, Sasebo and Shiga. This tour also included a high-profile visit to the area affected by the tsunami of 2011 and Fukushima. In April 2012, Anúna participated in the premiere of Philip Hammond’s Requiem for the Lost Souls of the Titanic at St Anne’s Cathedral, Belfast. In June 2012, Anúna released their new album Illumination, a fifteen track CD and, in May, featured on the soundtrack to the video game Diablo III. Blizzard Entertainment’s audio director, Russell Brower says “Working somewhat against conventional expectations, Hell is a beautiful and seductive sound, provided by Dublin’s uniquely astounding choral group ANÚNA”. As of February 2014, the game has sold 15 million copies across all platforms. In October, the choir gave a workshop at the Shanghai Conservatory and, in November, they hosted a series of public choral workshop events across the Netherlands. 2013 marks the first tour of Canada for the group, and included a series of workshops. In November 2017 Anúna released a video, created by Michael McGlynn, of the piece “Shadow of the Lowlands” composed by Yasunori Mitsuda. Speaking of his first encounter with Anúna through their album “Deep Dead Blue”, Mitsuda says “I felt that ANÚNA was a new type of chorus that I’d never heard before. My attention was drawn to the lead singer, Michael McGlynn, and I dreamt about making music with ANÚNA one day. After 20 years, my dream came true through the making of the game Xenoblade Chronicles 2”. “Shadow of the Lowlands” is one of four that features on the soundtrack of the Nintendo Switch video game Xenoblade Chronicles 2. In February 2018 the group won the Outstanding Ensemble category of the Annual Game Music Awards 2017 for their contributions to the game. The original name of the group, An Uaithne, “is the collective description for the three ancient forms of Irish music[…] the Goltraí (song of lament), Geantraí (song of joy) and Suantraí (the lullaby)”. McGlynn has reconstructed and arranged a substantial amount of early and medieval Irish music, as well as writing original pieces. Anúna do not work with a conductor in performance, and move throughout the venue at different points in concert. Their standard line-up is twelve to fourteen singers. John McGlynn is a tenor with Anúna and an Irish singer-songwriter. He is also Michael McGlynn’s identical twin brother. His distinctive guitar style features on many of Anúna’s albums. Originally an architect by trade, he currently acts as a director of the choir, touring in that capacity throughout Europe and the US. He released his solo album Songs For A Fallen Angel in 2000 and has formed a trio entitled Sweet June. His arrangements and original songs appear on a number of Anúna releases. “If All She Has Is You” appears on the Celtic Origins album and concert DVD and has been covered by Celtic Woman soloist Lynn Hilary on her debut solo album. Other arrangements and original pieces include “The Fisher King”, “Buachaill ón Éirne”, “Siúil a Rúin” and “O Come All Ye Faithful”. He features as a soloist on the albums Christmas Songs, Invocation, Anúna, Deep Dead Blue, Christmas Memories, Celtic Origins and Cynara. He appears as a soloist on the DVDs Invocations of Ireland, Celtic Origins and Christmas Memories. Lucy Champion is an English singer. She currently holds the position Education Co-ordinator with Anúna and is a featured soprano soloist with the choir. She appears as a soloist on the albums Christmas Songs, Invocation, Sensation, Anúna, Sanctus, Cynara, Deep Dead Blue, Christmas Memories, Celtic Origins and Behind the Closed Eye. She appears as a soloist on the DVDs Invocations of Ireland and Celtic Origins. She was Concerts and Events Manager for The Ulster Orchestra in Belfast, Administrator and Education Manager for the Wren Orchestra in London, Education Manager with the National Concert Hall in Dublin and is currently a choral clinician and educator, most recently giving a series of workshops at Dublin’s National Concert Hall in 2009/2010.